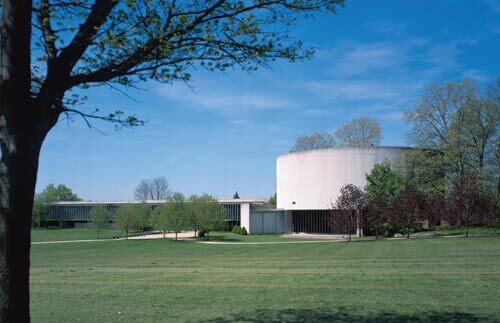 Neutra’s Cyclorama at Gettysburg, Pennsylvania is in need of reuse — any reuse. On the Gettysburg Battlefield in Pennsylvania, Richard Neutra’s Cyclorama Center is currently deteriorating while its fate is battled out in a U.S. district court. The building, owned by the National Park Service (NPS), was closed in 2008 and its contents, namely the 377-foot painting of Pickett’s Charge, relocated to a new, larger facility. Completed in 1961 under Mission 66, a program to help accommodate the postwar visitor boom, Neutra’s building stands as one of the first and most significant examples of the visitor center typology. It’s been noted that he held the Cyclorama Center closest to his heart, perhaps because of the powerful collision between functionalism and humanism achieved in the building, which still resonates today. 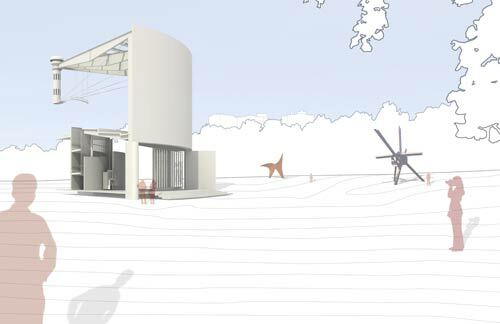 Neutra conceived the building as a living memorial to Abraham Lincoln’s Gettysburg Address. While the main attraction was the 1883 Cyclorama Painting upstairs depicting the battle in its final hours, downstairs the exhibit space climaxed in a great hall with sliding glass doors that open onto the battlefield to accommodate an audience of thousands. He envisioned world leaders speaking about themes of peace and unity annually on the anniversary of Lincoln’s speech. In providing such a stage, the powerful memory of Gettysburg would become a center of attention, making its lessons relevant to future generations. Unfortunately, due to turnover among Park Service leadership, no speaker was ever invited. The National Park Service, normally in the business of preservation, wishes to demolish the building because it sits atop the site of a significant fight in the battle and because it now interferes with their efforts to recreate the area’s period appearance during the Civil War. This motive has been countered by an international outpouring of support from preservationists to retain the building, and a lawsuit now several years old. Why now should we care about this modernist building in Gettysburg? Because in the end, this case is not about an isolated building and not about architectural style; it is about the very idea of preservation, and this in turn impacts the discourse of architecture. I offer the following proposals for the Cyclorama, not as mandates, but as propositions available to any building. One base scenario and sole objective of preservationists is Preservation as Retention—fully intact and unchanged. However, in this instance there are two sets of preservationists: one party for the building and one party for the landscape. The site for the building, determined by NPS in 1958, was consistent with their policy at the time to orient visitors with the greatest perspective. It’s also the vantage point of the Cyclorama Painting. The rationales for demolition put forth by NPS include the building’s sensitive location, technical failures, and obsolescence. The building preservationists have argued for its architectural significance and the fact that NPS neglected their legal duties to assess the environmental impacts and analyze alternatives to demolition. This all amounts to a debate of legal terminology, not preservation, and is absurd on many fronts; however, it has kept the building standing. The root of the debate lies in ongoing efforts to recreate the Gettysburg Battlefield to the appearance of Civil War times, what NPS terms restoration and rehabilitation. But since there’s little left to actually restore, they are left to recreate by cutting down swaths of trees, sculpting land, and creating new wooden fences and stone walls—undoing where nature has healed the scars of war. Yet the roads, red stop signs, and power lines remain in the vistas. Thematic recreation, even with the best of intentions, opens the door to the dangers of remaking and embellishing history. Then there are the more familiar rationales for demolition: It leaks, its systems are outdated, and the architects’ intentions were never realized. These failures don’t negate cultural relevance any more than the disintegration of wooden fence lines negates the cultural relevance of the Battle of Gettysburg. The building could easily be repaired and re-utilized with a complementary function to the newly constructed facility. However, maintaining properties in their original condition is not always possible and not always best. We must ask ourselves what we are preserving, and why? There are degrees of preservation that lie between maintaining the original condition and demolition. Let us consider Preservation as Informant: where an existing building takes the position of an informer, explaining source information to a user. In this scenario, the Cyclorama Center retains its core function—to act as an interpretation hub for the Gettysburg Battlefield. The only remaining portion of the building would be the ring of the rotunda in open air. Openings would be thoughtfully cut into the rotunda, framing key moments near and far on the battlefield as through the lens of a camera. What if we think of Preservation as Addition: a building added to another building? In this approach, the rotunda portion of Cyclorama would be moved several blocks to join a neighboring museum. It could revive the 900-square-foot electric map that depicts the fields and battle lines, and was once central to the Gettysburg experience. The orientation of Neutra’s great hall could create a new community plaza, and become a staging ground for special events much like Neutra had originally intended. How about preservation as Network: a collection of buildings united by their history? What if the Cyclorama and other ailing midcentury marvels were revitalized as transient housing? They could trigger economic development, promote sustainability, and become renewed as destinations for all travelers. What if we ponder Preservation as Remnant: an artful examination of the physical and temporal aspects of a building? Parts of a building may become urban furniture like bus stops and kiosks, or find their way to museums and sculpture gardens as artifacts that trigger memory. If we consider potential operations to a property, along with the underlying values of a property, we can form many degrees of preservation that have the power to enhance our historical awareness, create sustainable environments, embrace innovation, and enrich our culture. In doing so we could create a new kind of layered architecture that probes the ideas of memory and the meaning of preservation today. Human inhabitation is a dynamic force. Our built environment is both witness to and proof of history. The act of preservation is a necessity in maintaining the memory and authenticity of this record. The idea of preservation began in the late 18th century to preserve 2,000-year-old monuments. Through the last century, the preservation movement has expanded its reach significantly: from monument to building to streetscape to landscape to urban sectors to government policy to tax incentives; everything is now potentially susceptible to preservation. With this environmental and cultural expansion comes exponential complexity and great responsibility, yet its curatorial principles remain overly simplistic. Concurrently with this expansion, the movement has embraced an increasing number of value propositions to rationalize its aims, yet its accepted outcomes remain singular in encapsulating our past. But all places and buildings have a continuing history; they are used, damaged, repaired, and bear the markings of actions and events throughout time. As modern culture moves forward, our environment expands, is re-inhabited, and is altered with invention. This leaves the idea of preservation in a precarious state. To continuously encapsulate our built environment is counter-productive; we face increasing risk of endangering invention and even forgetting the intentions of history. If we are to live with our history while embracing our future, we must rethink the very idea and standards of preservation. Culture cannot thrive in a preserved state; if all is encapsulated, then all is forgotten. There are unexplored degrees of preservation between its ever-present all-or-nothing proposition. As preservation has embraced multiple value rationales, it must too embrace multiple outcomes. Preservation has the potential to become the catalyst for shaping richer and healthier environments. The continued relevance of our history, including the Cyclorama Center, depends upon it.